Biting into a fresh tomato or enjoying the crisp sweetness of an apple are pleasures that not everyone always gets to enjoy. While the nutritional value of fresh fruits and vegetables is well-documented, and although the local food industry has grown tremendously in the last several years, access to nutritious, local produce is not something that’s readily available to everyone with a limited income. University of Missouri researchers are working to change that. The aim of their two-year project is to develop effective nutrition improvement strategies among food pantry clients, including increasing access to fresh produce. 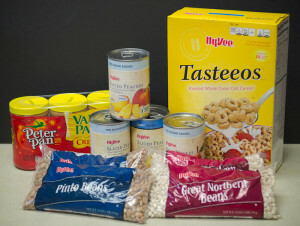 Previous MU research studies have shown food pantry clients’ risk of obesity is twice that of the general population. In the last 20 years, Missouri’s obesity rate has swelled from just over 10 percent to greater than 30 percent among adults, placing Missouri among the twelve most obese states in the nation. The Food Pantry Nutrition Project, headed by Sandy Rikoon, professor of rural sociology in the College of Agriculture, Food and Natural Resources and director of the Interdisciplinary Center for Food Security, is partnering with nine pantries in the mid-Missouri area to help evaluate the success of several intervention strategies to collect and distribute healthier food. The study builds on assessments conducted in 2005 and 2010 of thousands of people who use pantries in the Food Bank for Central and Northeast Missouri service area and ten years of client education by dietetic students at the Central Pantry in Columbia, Mo. The genesis of the project began six years ago when researchers surveyed about 1,300 clients of member food pantries of the Food Bank for Central and Northeast Missouri. “This was the first systematic look to profile the households that use food pantries,” Rikoon said. “What clients consume in part reflects what they have access to—the kind of food do the pantries get in. What do they target during food drives? How do they distribute food and take into account different needs? We know they take into account family size, but what if there’s diabetes in the family?” Rikoon asked. The team selected large and small pantries with varying days and hours of distribution, geography and resources, such as refrigeration and storage. The researchers then partnered with pantry directors to evaluate intervention strategies in a number of circumstances. Through this approach, the team hopes to generate best practices that could work in any pantry across the state or country. “We have lots of ideas about what could happen in the pantries, but realistically, we have to work with pantry directors and volunteers to put some things in place that are practical and doable,” said Bill McKelvey, coordinator of the project. Jennifer Snell, a research associate and dietician for the project, aims to supply that guidance with recipes that are easy, low cost and healthy. She creates recipes using the USDA’s Snap-Ed database, an online resource that generates recipes based on the ingredients users search. Schnell hopes that having such recipes will empower the clients and spark creativity in their kitchens. A strategy she employs is to host a recipe contest at some of the pantries to foster healthier eating awareness and knowledge sharing among pantry clients. She also brings samples to pantries so people can experience the foods before trying to prepare them at home. Her first recipe: quick bread made from baby food, an item the Shelby county pantry gets plenty of, despite not serving many families with babies. “I had to do a decent amount of ‘selling the product’ to get most clients to try the sample the baby food muffin,” Schnell said. “When they did try it, they were pleasantly surprised at its moist, fluffy texture and the flavor similar to a spice cake. The biggest take home message was that if an ingredient sounds odd, give the recipe a chance, you may be pleasantly surprised.” The bread also provided a vehicle to make the fruit-rich baby food appealing to all ages. Another goal of the project is to increase the amount of nutrient dense foods, including lean meats, dairy products and fruits and vegetables, available at pantries. To this end, McKelvey has been working with pantries to identify local sources of produce that could be donated to pantries. 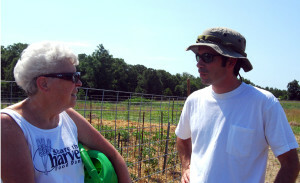 Bill McKelvey, project coordinator for the Food Pantry Nutrition Project, and Judy Wimmer, director … Expand ▸Bill McKelvey, project coordinator for the Food Pantry Nutrition Project, and Judy Wimmer, director of Share the Harvest Food Pantry and Resale Nook in Camden County, discuss growing methods at Share the Harvest’s community garden. This season in Cooper County 1045 pounds of produce was donated from the area’s correctional facility and home gardeners, in Saline County 1500 pounds of sweet corn from an FFA project in Malta Bend was donated, and pantries in Pettis and Benton Counties received various donations of produce. McKelvey hopes to build on these successes by partnering with farmers, farmers’ markets and groups such as the Society of St. Andrew, a national produce recovery non-profit that partners with farmers to harvest fresh fruits and vegetables that have been left behind. Since stepping into Missouri fields and orchards in 2008, the Society of St. Andrew has harvested more than 7.6 million pounds of produce, said Bernie Schneider, program director for the Society of St. Andrew West. In Camden County, Share the Harvest Food Pantry started their own their own garden to supply fresh fruits and vegetables to their clients. They partnered with Habitat for Humanity, the Lake Area Community Garden Coalition and other volunteers to grow their garden. In their first year, they supplied 30 pounds of green peppers to pantry clients and are still harvesting squash and cucumbers for distribution, said Judy Wimmer, director of Share the Harvest Food Pantry and Resale Nook. The pantry just moved into a new building with more capacity for cold storage and a kitchen to host cooking classes. The project team will implement additional interventions over the next two years, tracking and evaluating the success of each along the way. This fall they’re helping pantries promote healthy foods in their upcoming food drives. CAFNR is joining in the effort with a healthy food drive for homecoming week. In the central Missouri region, clients can visit a pantry once per month, so the food they get there makes up 10-25 percent of their food budget, McKelvey said. However, exposure to foods at the food pantry can lead to choosing that food at the grocery store. Joseph Presnell picks up food at Share the Harvest Food Pantry in Camden County. Presnell said he likes to try new things he finds at the pantry, including cranberry juice. It’s now a mainstay in his refrigerator. With a variety of interventions tailored to each pantry, the team aims to get more Missourians like Presnell trying—and then buying—healthier foods. “It’s not the majority of the food they consume—but if we can influence their selection and change people’s ideas about food, it will trickle into their food buying decisions at the supermarket; if they get SNAP benefits (USDA’s food stamp program) or WIC (USDA’s Women, Infants and Children program)—how they spend those. We’re hoping to have a broader impact on people’s behavior that will help them meet their health requirements,” Rikoon said. In addition to collaborating with the pantry directors, the team is also partnering with the Food Bank for Central and Northeast Missouri, the Central Missouri Produce Auction and the Missouri Food Bank Association in cooperation with the Missouri Department of Agriculture to get more nutritious foods to families in need. They’re also partnering with University of Missouri Extension Family Nutrition Education Program (FNEP) to help connect pantries to nutrition educators and resources. “One of the tightropes that you’re walking is that people need calories,” Rikoon said. “People need to meet their food security needs in terms of quantity of food. What we’re trying to do is not have pantries provide less food, but improve the quality of the food they distribute.” Rikoon said. Colleen Heflin, associate professor in the Truman School of Public Affairs.